Dia de los Muertos Masks! 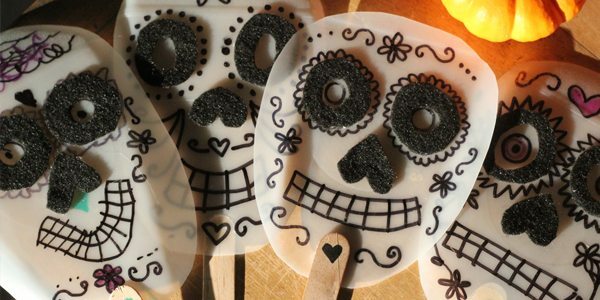 Here’s a fun and simple craft to celebrate Dia de los Muertos, a Mexican holiday for honoring the dead. This holiday falls on November 1st and 2nd and is often celebrated with skulls. Unlike Halloween though, it is not about gore and horror. It is a happy holiday to remember friends and family who have passed on before us. It is a time for singing and dancing and parades. I thought it would be fun to make some skull masks out of milk cartons. 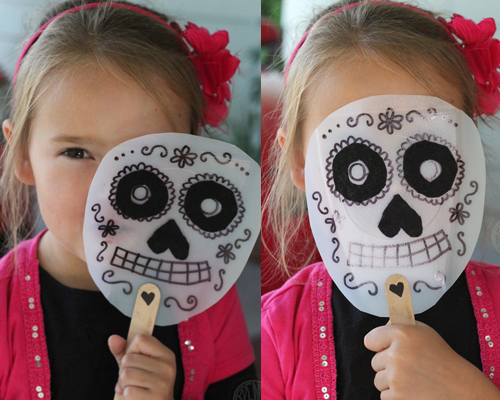 They are translucent and durable, perfect for waving around in a parade! 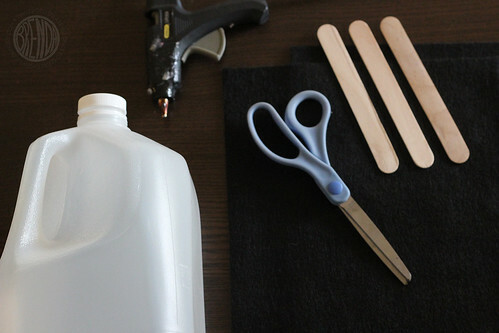 Step 1: Deconstruct your milk carton by first cutting off the top. 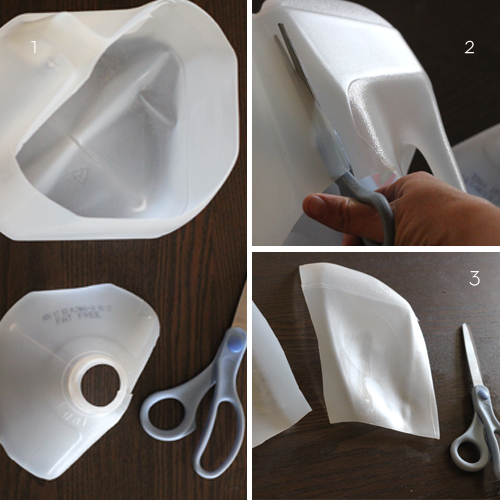 You can do this by inserting your scissors into the milk carton spout and cutting down the side a few inches past the thicker plastic. Then cut around the top until the top is removed. Next cut down the sides and around the main panels. 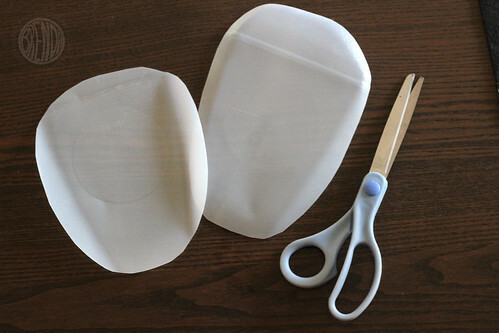 You should be able to get two panels per milk carton, though you could probably get creative and use the handle and sticker side too if you wanted to. The handle might make a fun nose. Step 2: Round your edges so they look like skulls. 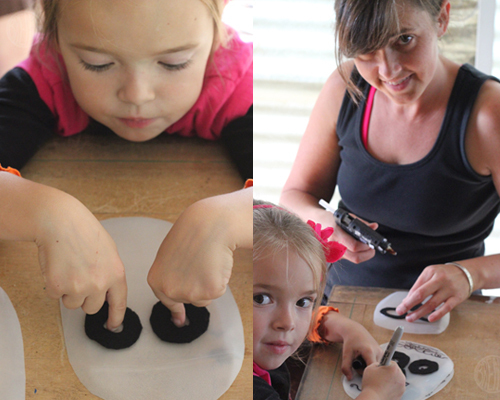 Step 3: Cut some felt circles for eyes (you can cut out the center of your circle by folding the circle in half). 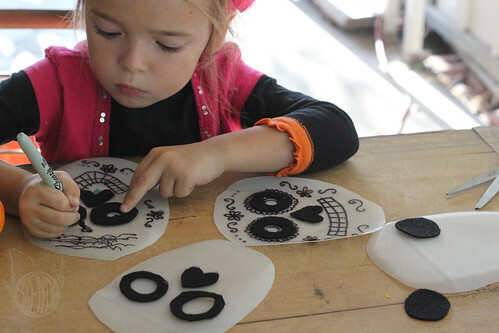 You can also use black foam or construction paper here but we had felt on hand so that is what we used. For the nose just cut out a heart and place it upside down. 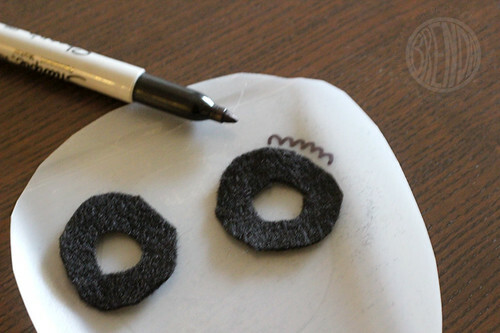 Position your felt where you would like it and the attach with a quick bead of hot glue. Rubber cement or paste would work here, you just need to allow more time for drying. For teeth, just draw in a long rectangle with your permanent marker, cross it once long ways and then a bunch of times up and down for individual teeth. If you want your skull to smile just round your rectangle up on the corners. Step 4: Now it’s time to decorate! Day of the Dead skulls are often ornately decorated with hearts and flowers and plenty of curlicues. My daughter loved tracing my designs by overlaying her skull over mine. Just be careful not to smudge your ink! Add your tongue depressor as a handle and you’re ready to celebrate! These are a great idea. I love that it celebrates diversity, and recycling too! I love this idea! 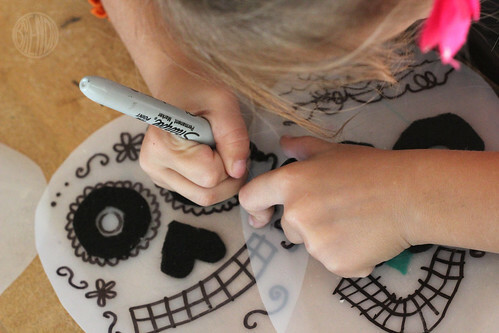 My kids and I love Dia de los Muertos, and I always love crafts where we can use what we have. Thanks for posting.